BEETROOT like onions so were planted next to them. Beetroot get along with most plants so place them with the carrots for visual effect with the differing foliage. CAPSICUM - RED PEPPERS and eggplant (aubergine) are companions so place one capsicum plant either side of the eggplant. CARROTS were placed next to the beetroot because beetroot gets along with most plants. CELERY and tomato are companion plants. The celery was also bordering the corn. CORN and lettuce are companion plants. You can plant the lettuce between the corn, the reason is the corn shelters the lettuce from the hot sun. CUCUMBER was planted along the fence line. They do have several companion plants though. Tie the cucumber along the fence. EGGPLANT - Aubergine grows well with capsicum so place it in between the capsicum plants. LETTUCE ICEBERG Plant these in between the corn so they get some shade in the hot afternoons. LETTUCE COS Place next to the onions because they are companions. MARIGOLDS are the classic companion planting flower. Scatter a few around the garden for insect control. The bright colours certainly added to the visual quality of the vegetable garden. MINT Use mint and spearmint on either side of the capsicum plants just for visual effect. They look fantastic, a very contrasting shade of green. ONIONS Plant the onions between the beetroot and the lettuce as they are companion plants to both. PEAS grow well with beans so place them together along the same fence line. SPEARMINT was planted there because of space and for visual effect. TOMATO was planted in these positions because of space requirements only. They were bordering beetroot, onion, lettuce, celery and corn, none of which are reported to be companion plants - except the celery. VIOLA Plant these blue flowers along the gate entrance into the garden and also along the edges of the cement stepping stone - mainly for visual effect. AMARANTH: A tropical annual that needs hot conditions to flourish. Good with sweet corn, it's leaves provide shade giving the corm a rich, moist root run. Host to predatory ground beetles. Eat the young leaves in salads. ANISE: Licorice flavored herb, good host for predatory wasps which prey on aphids and it is also said to repel aphids. Deters pests from brassicas by camouflaging their odor. Improves the vigor of any plants growing near it. Used in ointments to protect against bug stings and bites. Good to plant with coriander. Parsley, capsicum, basil, lettuce and tomato. Avoid: Onions, garlic and potatoes. BAY LEAF: A fresh leaf bay leaf in each storage container of beans or grains will deter weevils and moths. Sprinkle dried leaves with other deterrent herbs in garden as natural insecticide dust. A good combo: Bay leaves, cayenne pepper, tansy and peppermint. For ladybug invasions try spreading bay leaves around in your house anywhere they are getting in and congregating. They should leave. All beans enrich the soil with nitrogen fixed form the air. In general they are good company for carrots, celery, chards, corn, eggplant, peas, potatoes, brassicas, beets, radish, strawberry and cucumbers. Beans are great for heavy nitrogen users like corn and grain plants because beans fix nitrogen from the air into the soil so the nitrogen used up by the corn and grains are replaced at the end of the season when the bean plants die back. French Haricot beans, sweet corn and melons are a good combo. Summer savory deters bean beetles and improves growth and flavor. Keep beans away from the alliums. BEE BALM (Oswego, Monarda): Plant with tomatoes to improve growth and flavor. Great for attracting beneficials and bees of course. Pretty perennial that tends to get powdery mildew. BEET: Good for adding minerals to the soil. The leaves are composed of 25% magnesium making them a valuable addition to the compost pile if you don't care to eat them. Beets are also beneficial to beans with the exception of runner beans. Runner or pole beans and beets stunt each other's growth. Companions for beets are lettuce, onions and brassicas. Beets and kohlrabi grow perfectly together. Beets are helped by garlic and mints. Garlic improves growth and flavor. Rather than planting invasive mints around beets use your mint clippings as a mulch. BRASSICA: Benefit from chamomile, peppermint, dill, sage, and rosemary. They need rich soil with plenty of lime to flourish. Avoid planting with mustards, nightshades (tomatoes, peppers, etc). BUCKWHEAT: (Member of the family Polygonaceae) Accumulates calcium and can be grown as an excellent cover crop aka green manure. Buckwheat’s shallow white blossoms attract beneficial insects that control or parasitize aphids, mites and other pests. The beneficials it attracts include the following: hover flies (Syrphidae), predatory wasps, minute pirate bugs, insidious flower bugs, tachinid flies and lady beetles. Flowering may start within three weeks of planting and continue for up to 10 weeks. Buckwheat will take up phosphorus and some minor nutrients that are otherwise unavailable to plants. These nutrients are released as the residue of the buckwheat breaks down and are then available for later crops. The fine roots makes topsoil loose and friable with only minimal tillage. Celery, dill, onions and potatoes are good companion plants. Celery improves growth and health. Clover interplanted with cabbage has been shown to reduce the native cabbage aphid and cabbageworm populations by interfering with the colonization of the pests and increasing the number of predatory ground beetles. Plant Chamomile with cabbage as it Improves growth and flavor. Cabbage does not get along with strawberries, tomatoes, peppers, eggplants, rue, grapes and pole beans. CARAWAY: Good for loosening compacted soil with it's deep roots so it's also compatible next to shallow rooted crops. Plant it with strawberries. Caraway can be tricky to establish. The flowers attract a number of beneficial insects especially the tiny parasitic wasps. Keep it away from dill and fennel. CATNIP: Deters flea beetles, aphids, Japanese beetles, squash bugs, ants and weevils. We have found it repels mice quite well: mice were wreaking havoc in our outbuildings, we spread sprigs of mint throughout and the mice split! Use sprigs of mint anywhere in the house you want deter mice and ants. Smells good and very safe. Companions: Bean, cabbage family, leek, onion, spinach and tomato. Flowers for celery: cosmos, daisies and snapdragons. Foe: Corn. CHAMOMILE, GERMAN: Annual. Improves flavor of cabbages, cucumbers and onions. Host to hoverflies and wasps. Accumulates calcium, potassium and sulfur, later returning them to the soil. Increases oil production from herbs. Leave some flowers unpicked and German chamomile will reseed itself. 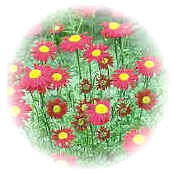 Roman chamomile is a low growing perennial that will tolerate almost any soil conditions. Both like full sun. Growing chamomile of any type is considered a tonic for anything you grow in the garden. CHARDS: Companions: Bean, cabbage family and onion. CHERVIL: Companion to radishes, lettuce and broccoli for improved growth and flavor. Keeps aphids off lettuce. Said to deter slugs. Likes shade. CHIVES: Improves growth and flavor of carrots and tomatoes. A friend to apples, carrots, tomatoes, brassica (broccoli, cabbage, mustard, etc) and many others. Keeps aphids help to keep aphids away from tomatoes, mums and sunflowers. Chives may drive away Japanese beetles and carrot rust fly. Planted among apple trees it helps prevent scab and among roses it prevents black spot. You will need patience as it takes about 3 years for plantings of chives to prevent the 2 diseases. A tea of chives may be used on cucumbers and gooseberries to prevent downy and powdery mildews. Avoid planting near beans and peas. CHRYSANTHEMUMS: C. coccineum kills root nematodes. (the bad ones) It's flowers along with those of C. cineraruaefolium have been used as botanical pesticides for centuries. (i.e. pyrethrum) White flowering chrysanthemums repel Japanese beetles. To the right is a picture of the painted daisy from which pyrethrum is extracted. CLOVER: Long used as a green manure and plant companion and is especially good to plant under grapevines. Attracts many beneficials. Useful planted around apple trees to attract predators of the woolly aphid. Clover interplanted with cabbage has been shown to reduce the native cabbage aphid and cabbageworm populations by interfering with the colonization of the pests and increasing the number of predator ground beetles. COMFREY: Accumulates calcium, phosphorous and potassium. Likes wet spots to grow in. Comfrey is beneficial to avocado and most other fruit trees. Traditional medicinal plant. Good trap crop for slugs. Amaranth, beans, cucumber, white geranium, lamb's quarters, melons, morning glory, parsley, peanuts, peas, potato, pumpkin, soybeans, squash and sunflower. 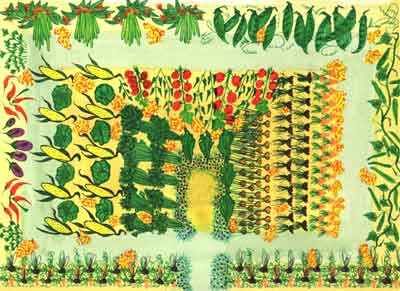 A classic example is to grow climbing beans up corn while inter-planting pumpkins. The corn provides a natural trellis for the beans, pumpkins smother the weeds and helps corn roots retain moisture. Corn is a heavy feeder and the beans fix nitrogen from air into the soil. The beans do not feed the corn while it is growing but when the bean plants die back they return nitrogen to the soil that was used up by the corn. A win-win situation. Another interesting helper for corn is the weed Pig's Thistle which raises nutrients from the subsoil to where the corn can reach them. Keep corn away from celery and tomato plants. COSTMARY: This 2-3 foot tall perennial of the chrysanthemum family helps to repel moths. Radish, lettuce, beans, peas and artichokes. Cucumbers are great to plant with corn and beans. The three plants like the same conditions warmth, rich soil and plenty of moisture. Let the cucumbers grow up and over your corn plants. A great duet is to plant cukes with sunflowers. The sunflowers provide a strong support for the vines. Cukes also do well with peas, beets, radishes and carrots. Radishes are a good deterrent against cucumber beetles. Dill planted with cucumbers helps by attracting beneficial predators. Nasturtium improves growth and flavor. Keep sage, potatoes and rue away from cucumbers. DAHLIAS: These beautiful, tuberous annuals that can have up to dinner plate size flowers repels nematodes! DILL: Improves growth and health of cabbage. Do not plant near carrots, caraway or tomatoes. Best friend for lettuce. Attracts hoverflies and predatory wasps. Repels aphids and spider mites to some degree. Also may repel the dreaded squash bug! (scatter some good size dill leaves on plants that are suspect to squash bugs, like squash plants.) Dill goes well with lettuce, onions, cabbage, sweet corn and cucumbers. Dill does attract the tomato horn worm so it would be useful to plant it somewhere away from your tomato plants to keep the destructive horn worm away from them. Do plant dill in an appropriate spot for the swallowtail butterfly caterpillars to feed on. Even their caterpillars are beautiful. Plant with amaranth, beans, peas, spinach, tarragon, thyme and marigold. Eggplant is a member of the nightshade family and does well with peppers. Avoid planting fennel near eggplant. ELDERBERRY: A spray made from the leaves can be used against aphids, carrot root fly, cucumber beetles and peach tree borers. Put branches and leaves in mole runs to banish them. Elderberry leaves added to the compost pile speeds up the decomposing process. FLAX: Plant with carrots, and potatoes. Flax contains tannin and linseed oils which may offend the Colorado potato bug. Flax is an annual from 1-4 feet tall with blue or white flowers that readily self sows. FOUR-O'CLOCKS: Draws Japanese beetles like a magnet which then dine on the foliage. The foliage is pure poison to them and they won't live to have dessert! It is important to mention that Four O'clock are also poisonous to humans and animals. Please be careful where you plant them if you have children and pets. They are a beautiful annual plant growing from 2-3 feet high with a bushy growth form. GARLIC: Plant near roses to repel aphids. It also benefits apple trees, pear trees, cucumbers, peas, lettuce and celery. Garlic accumulates sulfur: a naturally occurring fungicide which will help in the garden with disease prevention. Garlic is systemic in action as it is taken up the plants through their pores and when garlic tea is used as a soil drench it is also taken up by the plant roots. Has value in offending codling moths, Japanese beetles, root maggots, snails, and carrot root fly. Researchers have observed that time-released garlic capsules planted at the bases of fruit trees actually kept deer away. It's certainly worth a try! Concentrated garlic sprays have been observed to repel and kill whiteflies, aphids and fungus gnats among others with as little as a 6-8% concentration! It is safe for use on orchids too. GERANIUM: -Repels cabbage worms and Japanese beetles, plant around grapes, roses, corn, tomatoes, peppers and cabbage. Geraniums help to distract beet leafhoppers, carrier of the curly top virus. GOPHER PURGE: Deters gophers, and moles. 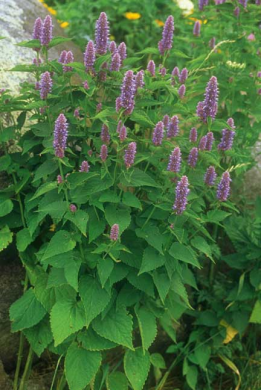 GRAPES: Hyssop is beneficial to grapes as are basil, beans, geraniums, oregano, clover, peas, or blackberries. Keep radishes and cabbage away from grapes. Planting clover increases the soil fertility for grapes. Chives with grapes help repel aphids. Plant your vines under Elm or Mulberry trees. HEMP: Repels many types of beetles which attack brassicas. HORSERADISH: Plant in containers in the potato patch to keep away Colorado potato bugs. Horseradish increases the disease resistance of potatoes. There are some very effective insect sprays that can be made with the root. Use the bottomless pot method to keep horseradish contained. Also repels Blister beetles. We have observed that the root can yield anti-fungal properties when a tea is made from it. HOREHOUND: (Marrubium Vulgare) like many varieties in the mint family, the many tiny flowers attract Braconid and Icheumonid wasps, and Tachnid and Syrid flies. The larval forms of these insects parasitize or otherwise consume many other insects pests. It grows where many others fail to thrive and can survive harsh winters. Blooms over a long season, attracting beneficial insects almost as long as you are likely to need them. For best results use horehound directly as a companion plant. Stimulates and aids fruiting in tomatoes and peppers. KOHLRABI: May be planted with cucumber, onion and chives. Kohlrabi and beets are perfect to grow with one another! Do not plant kohlrabi with pole beans, pepper, strawberry or tomatoes. Use leeks near apple trees, carrots, celery and onions which will improve their growth. Leeks also repel carrot flies. Avoid planting near legumes. Does well with beets, bush beans, pole beans, cabbage, carrots, cucumbers, onion, radish and strawberries. It grows happily in the shade under young sunflowers. 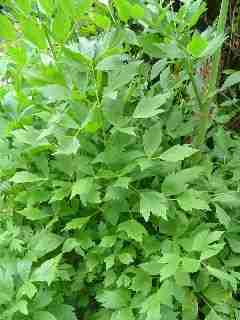 LOVAGE: Improves flavor and health of most plants. Good habitat for ground beetles. A large plant, use one planted as a backdrop. Similar to celery in flavor. French Marigold (T. patula) has roots that exude a substance which spreads in their immediate vicinity killing nematodes. For nematode control you want to plant dense areas of them. There have been some studies done that proved this nematode killing effect lasted for several years after the plants were These marigolds also help to deter whiteflies when planted around tomatoes and can be used in greenhouses for the same purpose. Whiteflies hate the smell of marigolds. Do not plant French marigolds next to bean plants. MELONS: Companions: Corn, pumpkin, radish and squash. Other suggested helpers for melons are as follows: Marigold deters beetles, nasturtium deters bugs and beetles. Oregano provides general pest protection. Deters white cabbage moths, ants, rodents, flea beetles, fleas, aphids and improves the health of cabbage and tomatoes. Use cuttings as a mulch around members of the brassica family. Mint flowers attract hoverflies and predatory wasps. Earthworms are quite attracted to mint plantings. Be careful where you plant it as mint is an incredibly invasive perennial. We have found that placing peppermint cuttings (fresh or dried) where mice are a problem is very effective in driving them off! MOLE PLANTS: (castor bean plant) Deter moles and mice if planted here and there throughout the garden. Drop a seed of this in mole runs to drive them away. This is a poisonous plant. MORNING GLORIES: They attract hoverflies. Plus if you want a fast growing annual vine to cover something up morning glory is an excellent choice. NASTURTIUMS: Nasturtium is an excellent companion for many plants. It is a companion to radishes, cabbage family plants (cabbage, collards, cauliflower, kale, kohlrabi, broccoli and mustards), deterring aphids, squash bugs, and striped pumpkin beetles, and improving growth and flavor. Plant as a barrier around tomatoes, cabbage, cucumbers, and under fruit trees. Deters wooly aphids, whiteflies, cucumber beetles and other pests of the cucurbit family. Great trap crop for aphids (in particular the black aphids) which it does attract, especially the yellow flowering varieties. It likes poor soil with low moisture and no fertilizer. Keeping that in mind there is no reason not to set potted nasturtiums among your garden beds. It has been the practice of some fruit growers that planting nasturtiums every year in the root zone of fruit trees allow the trees to take up the pungent odor of the plants and repel bugs. Studies say it is among the best at attracting predatory insects. It has no taste effect on the fruit. A nice variety to grow is Alaska which has attractive green and white variegated leaves. The leaves, flowers and seeds of nasturtiums are all edible and wonderful in salads! NETTLES, STINGING: The flowers attract bees. Sprays made from these are rich in silica and calcium. Invigorating for plants and improves their disease resistance. Leaving the mixture to rot, it then makes an excellent liquid feed. Comfrey improves the liquid feed even more. Hairs on the nettles' leaves contain formic acid which "stings" you. OKRA: (Hibiscus esculentus ) Plant lettuce around your okra plants and they will shade the lettuce in the summer giving you some more growing time. Okra also does well with peppers and eggplants as it helps protect these brittle stemmed plants from high winds. It also gets along with basil, cucumbers, melons, and black eyed peas. For planting with the peas plant your Okra first. When the okra is up and established plant the peas around the edges of the okra planting. You may find that the peas are far less bothered by aphids when near okra. Allies: Asparagus, carrot, chives, onions, roses and tomato. Sprinkle the leaves on tomatoes, and asparagus. Use as a tea to ward off asparagus beetles. Attracts hoverflies. Let some go to seed to attract the tiny parasitic wasps and hoverflies. 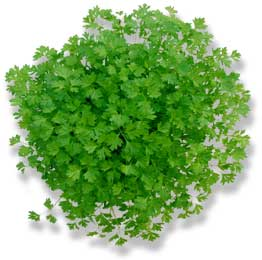 Parsley increases the fragrance of roses when planted around their base Mint and parsley are enemies. Keep them well away from one another. Peas fix nitrogen in the soil. Plant next to corn. Companions for peas are bush beans, Pole Beans, Carrots, Celery, Chicory, Corn Cucumber, Eggplant, Parsley, Early Potato, Radish, Spinach, Strawberry, Sweet pepper and Turnips. Do not plant peas with onions. PEPPERMINT: Repels white cabbage moths, aphids and flea beetles. It is the menthol content in mints that acts as an insect repellant. Bees and other good guys love it. PEPPERS, BELL (Sweet Peppers): Plant peppers near tomatoes, parsley, basil, geraniums, marjoram, lovage, petunia and carrots. Onions make an excellent companion plant for peppers. They do quite well with okra as it shelters them and protects the brittle stems from wind. Don't plant them near fennel or kohlrabi. They should also not be grown near apricot trees because a fungus that the pepper is prone to can cause a lot of harm to the apricot tree. Peppers can double as ornamentals, so tuck some into flowerbeds and borders. Harvesting tip: The traditional bell pepper, for example, is harvested green, even though most varieties will mature red, orange, or yellow. Peppers can be harvested at any stage of growth, but their flavor doesn't fully develop until maturity. Chili peppers have root exudates that prevent root rot and other Fusarium diseases. Plant anywhere you have these problems. While you should always plant chili peppers close together, providing shelter from the sun with other plants will help keep them from drying out and provide more humidity. Tomato plants, green peppers, and okra are good protection for them. Teas made from hot peppers can be useful as insect sprays. Hot peppers like to be grouped with cucumbers, eggplant, escarole, tomato, lettuce, okra, Swiss chard and squash. Herbs to plant near them include: basils, oregano, parsley and rosemary. Never put them next to any beans, broccoli, cabbage, cauliflower, Brussels sprouts or fennel. PENNYROYAL: Repels fleas. The leaves when crushed and rubbed onto your skin will repel chiggers, flies, gnats, mosquitoes and ticks. Warning: Pennyroyal is highly toxic to cats. It should not be planted where cats might ingest it and never rubbed onto their skin. POACHED EGG PLANT: Grow poached egg plant with tomatoes, they will attract hover flies and hover flies eat aphids. Companions for potatoes are bush bean, members of the cabbage family, carrot, celery, corn, dead nettle, flax, horseradish, marigold, peas, petunia, onion and Tagetes marigold. Protect them from scab by putting comfrey leaves in with your potato sets at planting time. Horseradish, planted at the corners of the potato patch, provides general protection. Don't plant these around potatoes: asparagus, cucumber, kohlrabi, parsnip, pumpkin, rutabaga, squash family, sunflower, turnip and fennel. Keep potatoes and tomatoes apart as they both can get early and late blight contaminating each other. Pumpkin pals are corn, melon and squash. Marigold deters beetles. Nasturtium deters bugs, beetles. Oregano provides general pest protection. One of the workhorses for the garden. Companions for radishes are: radish, beet, bush beans, pole beans, carrots, chervil, cucumber, lettuce, melons, nasturtium, parsnip, peas, spinach and members of the squash family. Why plant radishes with your squash plants? Radishes may protect them from squash borers. Anything that will help keep them away is worth a try. Radishes are a deterrent against cucumber beetles and rust flies. Chervil and nasturtium improve radish growth and flavor. Planting them around corn and letting them go to seed will also help fight corn borers. Chinese Daikon and Snow Belle radishes are favorites of flea beetles. Plant these at 6 to 12 inch intervals amongst broccoli. In one trial, this measurably reduced damage to broccoli. Radishes will lure leafminers away from spinach. The damage the leafminers do to radish leaves does not stop the radish roots from growing, a win-win situation. Keep radishes away from hyssop plants, cabbage, cauliflower, Brussels sprouts and turnips. RHUBARB: A good companion to all brassicas. Try planting cabbage and broccoli plants your rhubarb patch watch them thrive. Rhubarb protects beans against black fly. Some other interesting companions for rhubarb are the beautiful columbine flowers, garlic, onion and roses! It helps deter red spider mites from the columbines. A spray made from boiled rhubarb leaves, which contain the poison oxalic acid may be used to prevent blackspot on roses and as an aphicide. ROSEMARY: Companion plant to cabbage, beans, carrots and sage. Deters cabbage moths, bean beetles, and carrot flies. Use cuttings to place by the crowns of carrots for carrot flies. Zones 6 and colder can overwinter rosemary as houseplants or take cuttings. RUE: Deters aphids, fish moths, flea beetle, onion maggot, slugs, snails, flies and Japanese beetles in roses and raspberries. 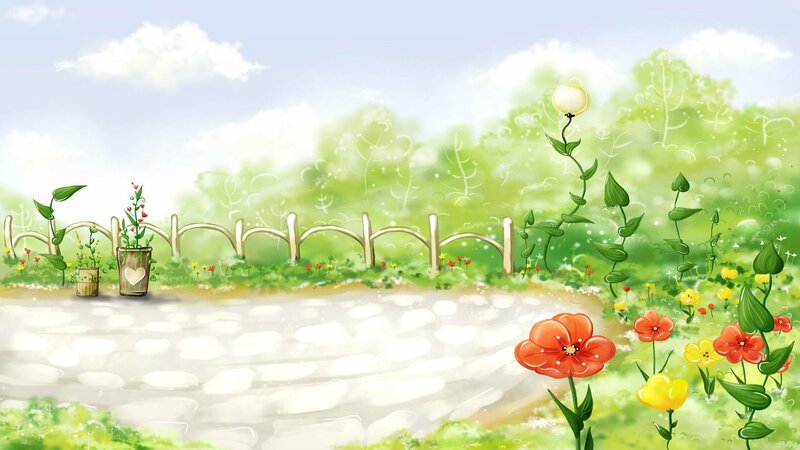 Companions for rue are roses, fruits (in particular figs), raspberries and lavender. To make it even more effective with Japanese beetles: crush a few leaves to release the smell. Has helped repel cats for us. You should not plant rue near cucumbers, cabbage, basil or sage. 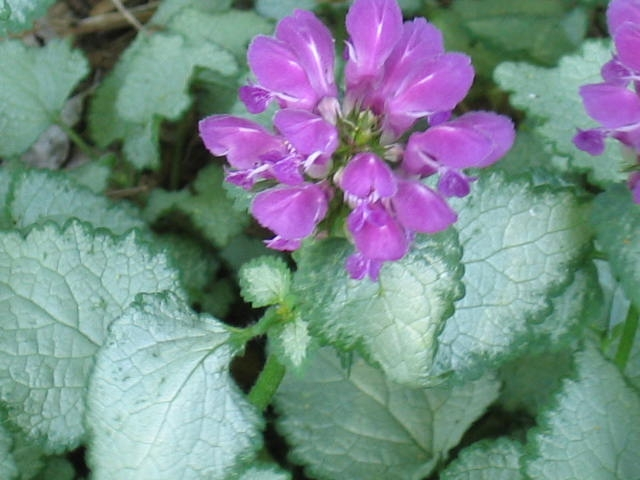 A pretty perennial with bluish-gray leaves. May be grown indoors in a sunny window. Rue may cause skin irritation in some individuals. RYE: An excellent use of plant allelopathy is the use of mow-killed grain rye as a mulch. The allelochemicals that leach from the rye residue prevent weed germination but do not harm transplanted tomatoes, broccoli, or many other vegetables. Plant with peas and beans as they provide natural shade for the spinach. Gets along with cabbage, cauliflower, celery, eggplant, onion, peas, strawberries. 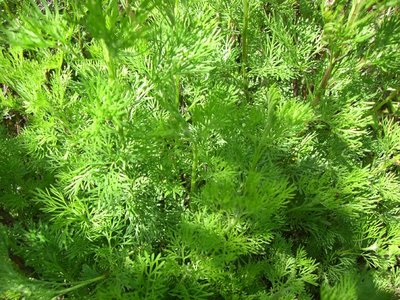 SOUTHERNWOOD: Plant with cabbage, and here and there in the garden. Wonderful lemony scent when crushed or brushed in passing. Roots easily from cuttings. Does not like fertilizer! It is a perennial that can get quite bushy. We have started to cut it back every spring and it comes back in no time. A delightful plant that is virtually pest free. SOYBEANS: They add nitrogen to the soil making them a good companion to corn. They repel chinch bugs and Japanese beetles. Why not try soybeans, they are good for you. They are many tasty ways to prepare them. SQUASH: Companions: Corn, cucumbers, icicle radishes, melon and pumpkin. Helpers: Borage deters worms, improves growth and flavor. Marigolds deters beetle. Nasturtium deters squash bugs and beetles. Oregano provides general pest protection. Friends are beans, borage, lettuce, onions, spinach and thyme. 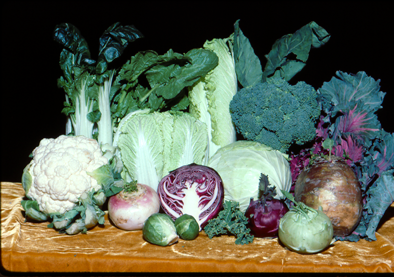 Foes: Cabbage, broccoli, Brussels sprouts, cauliflower and kohlrabi. 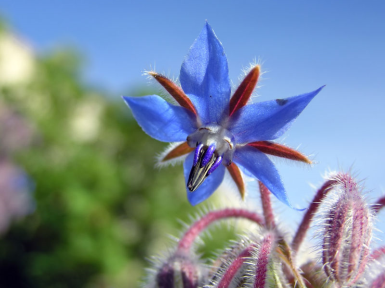 Allies: Borage strengthens resistance to insects and disease. Thyme, as a border, deters worms. 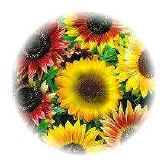 SUNFLOWERS: Planting sunflowers with corn is said by some to increase the yield. Aphids a problem? Definitely plant a few sunflowers here and there in the garden. Step back and watch the ants herd the aphids onto them. We have been doing this for years and it is remarkable. The sunflowers are so tough that the aphids cause very little damage and you will have nice seed heads for the birds to enjoy. Sunflowers also attract hummingbirds which eat whiteflies. Talk about a symbiotic relationship! SWEET ALYSSUM: Direct seed or set out starts of sweet alyssum near plants that have been attacked by aphids in the past. Alyssum flowers attract hoverflies whose larva devour aphids. Another plus is their blooms draw bees to pollinate early blooming fruit trees. They will reseed freely and make a beautiful groundcover every year. TANSY: Plant with fruit trees, roses and raspberries keeping in mind that it can be invasive and is not the most attractive of plants. Tansy which is often recommended as an ant repellant may only work on sugar type ants. These are the ones that you see on peonies and marching into the kitchen. At least for us placing tansy clippings by the greenhouse door has kept them out. Deters flying insects, Japanese beetles, striped cucumber beetles, squash bugs, ants and mice! Tie up and hang a bunch of tansy leaves indoors as a fly repellent. Use clippings as a mulch as needed. Don't be afraid to cut the plant up as tansy will bounce back from any abuse heaped on it! It is also a helpful addition to the compost pile with its' high potassium content. Tansy Warning: You do not want to plant Tansy anywhere that livestock can feed on it as it is toxic to many animals. Do not let it go to seed either as it may germinate in livestock fields. Tomato allies are many: asparagus, basil, bean, carrots, celery, chive, cucumber, garlic, head lettuce, marigold, mint, nasturtium, onion, parsley, pepper, marigold, pot marigold and sow thistle. One drawback with tomatoes and carrots: tomato plants can stunt the growth of your carrots but the carrots will still be of good flavor. 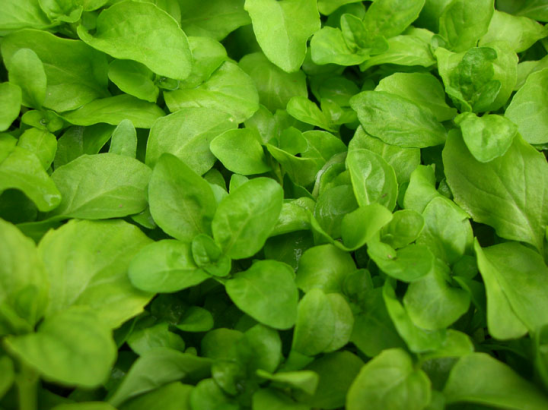 Basil repels flies and mosquitoes, improves growth and flavor. Bee balm, chives and mint improve health and flavor. Borage deters tomato worm, improves growth and flavor. Dill, until mature, improves growth and health, mature dill retards tomato growth. Enemies: corn and tomato are attacked by the same worm. Kohlrabi stunts tomato growth. Keep potatoes and tomatoes apart as they both can get early and late blight contaminating each other. Keep cabbage and cauliflower away from them. Don't plant them under walnut trees as they will get walnut wilt: a disease of tomatoes growing underneath walnut trees. WHITE GERANIUMS: These members of the pelargonum family draw Japanese beetles to feast on the foliage which in turn kills them. WORMWOOD: Keeps animals out of the garden when planted as a border. An excellent deterrent to most insects. Don’t plant wormwood with peas or beans. A tea made from wormwood will repel cabbage moths, slugs, snails, black flea beetles and fleas effectively. The two best varieties for making insect spray are Silver King and Powis Castle. Adversely Powis castle attracts ladybugs which in turn breed directly on the plant. 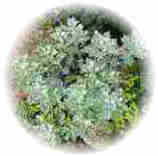 Silver Mound is great as a border plant and the most toxic wormwood. Note: As wormwood actually produces a botanical poison do not use it directly on food crops. YARROW: Yarrow has insect repelling qualities and is an excellent natural fertilizer. A handful of yarrow leaves added to the compost pile really speeds things up. Try it! It also attracts predatory wasps and ladybugs to name just two. It may increase the essential oil content of herbs when planted among them. Yarrow has so many wonderful properties. 1. It is best to use any type of spray in the early morning or the cool of evening. Do not spray when temps are above 80 degrees Fahrenheit! Your plants may "burn" or have a reaction to what you are using in excessive heat. This is known as "phytotoxicity"
2. Always perform a test on a small portion of the plant material first. Wait 24 hours to observe any negative reaction. Proceed if there is no damage. 3. Really and truly...more is not better. If you are not getting good results don't increase the strength of these remedies without testing first. 4. Target just the area you need to treat. Be careful... try not to harm the good guys! You don't want to run off your allies. 5. When working with sprays or dusts always protect your exposed skin and face. Some of these ingredients can be very irritating to your skin, eyes and mucous membranes, especially any hot pepper sprays. Elder Leaf Insecticide: (Box Elder)Target insects: Aphids, carrot root fly, cucumber beetles, peach tree borers, and root maggots. It is particularly effective against midges. Elder leaves also have fungicidal properties and may be useful against mildew and blackspot diseases. To make: simmer 8 ounces of leaves in 16 ounces of water for 30 minutes. Stir this thoroughly, then strain. Take 16 ounces of warm water and mix with 1 tablespoon of castile soap. Add soap mixture to the elder water, spray as needed. Note: Set your sprayer to a coarse or large droplet setting as this mixture will tend to plug a fine setting. Target insects: Aphids, cabbage loopers, grasshoppers, June bugs, leafhoppers, mites, squash bugs, slugs and whiteflies. May also help to repel rabbits! Never use oils sprays on Blue Spruce as it will remove the blue waxy coating on the needles! Because garlic contains naturally occurring sulfur it also acts as an antibacterial agent and fungus preventative. When working with oil sprays you want to monitor the climate conditions so your plants won't get phytotoxic burn. Use this simple equation: Take the current outdoor Fahrenheit temperature then add to this the percentage of humidity, if the total is more than 140 don't spray. Example: Temperature of 80 degrees plus humidity of 67 percent equals 147, don't spray. You also do not want to spray when temps are above 80F. Target insects: Aphids and soft-bodied insects. Also an excellent plant tonic! Yarrow has insecticidal properties and is also an excellent natural fertilizer. Try mixing this with strong coffee to make a more powerful brew. Yes, coffee, caffeine makes the insects hyper and confused. To make: Soak 1 cup of yarrow plant pieces in 16 ounces of water for 24 hours or more. Brew it in the sun like tea. Strain and mix with 1 gallon of water. Mix in strongly brewed coffee and 1/4 teaspoon castile soap. Spray on aphids and other soft bodied pests every 1-2 weeks. Or use as a preventative. Chive Spray:For preventing apple scab and downy mildew on cucumber, pumpkin and zucchini. To make: Put a bunch of chopped chives in a heat proof glass container, cover with boiling water. Let this sit until cool, strain and spray as often as two to three times a week. Compost and Manure TeasMany people have success with manure tea keeping blight and other pathogens away from plant. Soak the area around plants and use as a foliar spray. Do not use on seedlings as it may encourage damping-off disease. Fill a 30 gallon trash can with water. Let sit for 24 hours to evaporate the additives (use rain water if you can). Add about 4 shovels worth of manure to this and cover. Let it sit for 2-3 weeks, stirring once a day. Strain and apply as needed. Chicken manure: nitrogen rich: use for heavy feeders such as corn, tomatoes and squash. Cow Manure: potash: use for root crops. Rabbit manure: promotes strong leaves and stems. Hydrogen Peroxide TreatmentTo prevent bacterial and fungal problems on outdoor plants use hydrogen peroxide! Hydrogen peroxide will prevent the disease spores from adhering to the plant tissue. It causes no harm to plants or soil, however don't use on young transplants or direct seeded crops until they have become established. Warning: Always test on a small portion of plant tissue first to check for any negative reactions. Do not proceed if there is any damage to plant tissue. Do not substitute food grade H2O2 for the common H2O2. Spray plants with undiluted 3 percent hydrogen peroxide that you can buy most anywhere. Be sure to cover tops and bottoms of leaves. Do this once a week during dry weather and twice a week in wet weather. This works as a preventative. If you already have problems use this as a direct treatment. Milk for MildewMilk with its' natural enzymes and simple sugar structures can be used to combat various mildews on cucumber, asters, tomato, squash and zinnia foliage. This works by changing the pH on the surface of the leaves, so they are less susceptible to mildew. Use a 50/50 mixture of milk and water. Thoroughly spray plants every 3 to 4 days at first sign of mildews or use weekly as a preventative measure. Milk can also be mixed at a rate of 2 ounces milk to 18 ounces of water and used as a spray every 7 to 10 days to treat mosaic disease on cucumber, tomato and lettuce. Seedlings: Damping off diseaseAlways use a sterile growing medium like mixes with vermiculite and perlite for your seed starting as these should not contain the fungi that cause damping-off. Water your seedlings with warm water that has been left to sit for an hour or more to dissipate most of the chemicals that are present in tap water. Using cold water stresses the seedlings leaving them vulnerable to harmful organisms. The best damping off remedy: Powdered cinnamon!Sprinkle powdered cinnamon on the soiless medium surface. Don't worry if you get cinnamon on your plants as it will not hurt the tender seedlings. We have been using this method for years with near 100% effectiveness.